So as I lined up at the starting line, I ran (pun intended) into 2 coworkers and whether they realized it or not, helped calm myself before the race. Next thing I knew, it was time to start. So off I was, armed with my game plan. Now, the lesson I had learned from the previous 2 races is that no matter how much I try, the right amount of hydrating and nutrition do not make up for proper rest on the eve of Race Days. And I would pay DEARLY for this lesson. As I started, my phone rang and I saw it was Damary. See, we had a plan, she would bring the girls later, so they could get some extra rest and then I would see them at the finish line. Well she called to say Babygirl had a fever so she was staying home with the girls. Which I understood that. I also know that my Beautiful Wife and Our Daughters cheering for me, are my personal reward at the Finish Line. So for the 2nd straight race, I wouldn't have them there. SO I quickly made a mental resolve of that and went "back to work" on the course. Well, I basically had a plan of attack broken into 5 parts: The first part of the race, pre Iroquois Park; Then Iroquois Park (it is 3 miles of uphill and downhill); then the way back to the stadium; The Denny Crum Overpass, which is STEEP; and Finally, the last part going into the finish, giving it all that I had. Well, coming out of Iroquois, I noticed my time was looking great, but nature called. 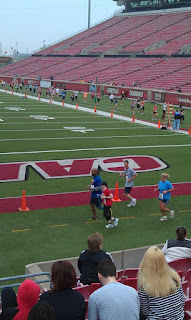 This is only the second race of my life where I HAD to stop and use the bathroom (first being the Marathon). So that sucked at least 5 minutes from my running. So I got back and kept up a decent pace, knowing the Denny Crum Overpass was waiting for me. I did notice at this point, my body was feeling like it has NEVER felt before in any of my races. I wiped sweat from my brow, and my limbs felt foreign to me. Best way to describe it is, that instant right before you get a muscle cramp, combined with that split second feeling before you crack/pop your joints, knuckles, etc. Just plain awkward. I wasn't dehydrated, nor out of fuel, this was something new I was experiencing as a runner. This was flat out overuse of the muscle...the kind of overuse that they haven't had sufficient recharging time. So, at that point I had two choices: Slow Down or G.O. and hope that if I break down, at least I've crossed the finish line. I decided if I go down, I go down trying, not wishing I had tried. So I kept up a great pace and then saw the impending Denny Crum Overpass. A Twitter friend of mine took this pic!! The person next to me is Erin!! :)I got there and relaxed my shoulders and dug in..and I DID NOT WALK ANY OF IT!! and then I let my brain go...I let it go thinking of how very soon I would be in the stadium. I would remember to look up as I finished to see myself on the giant screen. Well, as I entered the stadium, I hear Erin call my name. Erin is a wonderful Daily Mile friend who, at the LSC Louisville Half Marathon in November (2nd Half Marathon in 2 weeks), helped me get through some rough miles. She is a wonderful person and I am blessed and honored to call her friend. Well we talked and then I dug in and finished strong...Then I got the text. The text that basically said I didn't P.R. or P.B...but less than 20 frakkin seconds!! Less than 2 seconds a mile! Well, I am not making excuses, and I can say today, I still feel drained. My muscles will really need some extra recovery before I resume Marathon training. Everything feels basically like loose joints on hinges on a door. On top of all of that, I have the Zombie 5K Survival Run next week. I would also like to say THANK YOU to all of you who have always been encouraging to me. I am not a world class athlete, but I have some World Class Friends! Nice. Congrats on the finish. You worked for it.